Journalism student Awakhiwe Dlodlo went to her first football game — and won the equivalent of a tuition waiver. She received the special promotional prize from Athletics Director Katie Sheahan (left) and Danny Kane, of the Bookstore. 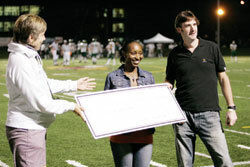 The raffle at the Homecoming football game on Sept. 8 was an effort to get more students into the stands. More than 4,000 fans watched the Stingers win 18-15 against the Université de Sherbrooke Vert et Or. Also part of Homecoming 2006 was the Abitibi-Consolidated Lecture, given Sept. 7 by child rights activist Craig Kielburger.